Urumqi explosions: China has a real terrorism problem now. 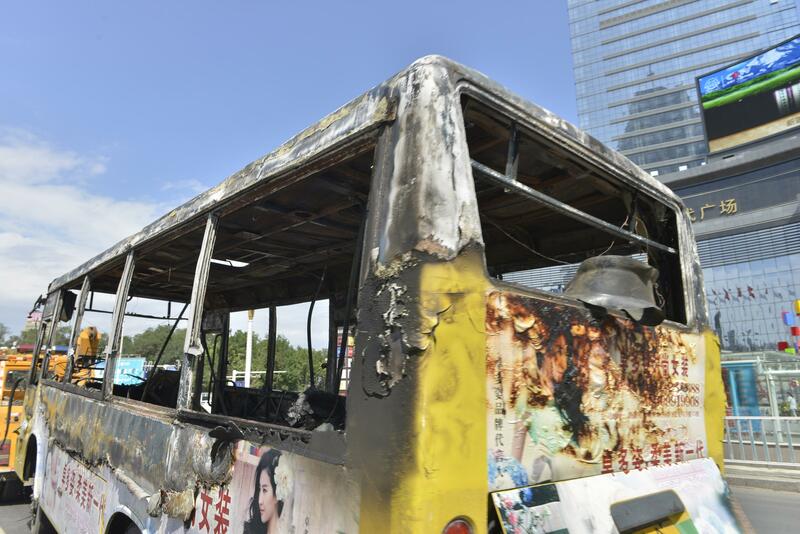 The shell of a burnt-out bus is towed by a rescue vehicle along a street in Urumqi on Aug. 5, 2013. I’m a bit surprised that the explosion that killed dozens of people at an open-air market in the city of Urumqi in China’s Xinjiang province yesterday hasn’t gotten more international notice. It may be because this is a pretty busy international news day, or because of the sheer quantity of China-related news for the world to digest right now. But I suspect it’s also because these incidents are becoming depressingly commonplace. Today’s explosion follows recent deadly attacks on train stations in Guangzhou, Urumqi, and Kunming, all of them blamed on Uighur extremists from Xinjiang. Today’s attack, however, is of another order of magnitude more serious. With at least 30 dead, it may be China’s most serious terrorist attack in years, and the use of explosives indicates an escalation in tactics over the other recent attacks, most of which were mass stabbings. The mysterious car attack on Tiananmen Square, which took place while I was in Beijing last October, would have been a substantially more serious event if the perpetrators had used the tactics seen today. After the last attack in Urumqi, President Xi Jinping promised a “strike first” strategy against separatists in Xinjiang, where Uighur Muslims have longed agitated for independence and claimed discrimination by the authorities. But with attacks expanding in both geographical scope and severity, it’s becoming increasingly clear that Beijing’s default strategy of cracking down hard on Xinjiang isn’t working.